Breakfast: Blueberry smoothies for Dad and LP followed by oatmeal for everyone! Lunch: Leftover chili for Mom and IP. LP and Dad had some hummus on toast and quinoa! Dinner: Kale, mushrooms and udon noodles in miso broth. Accompanied by Chinese five-spice baked tofu. Today we had a low-key day at home. Nothing spent! Snow chili is one of my favorite winter dishes. It is a white bean-based chili with some basic spices that somehow all come together beautifully. Serve it with some tortilla chips for some serious deliciousness! Note: I use frozen tofu to give this dish some great texture. Simply freeze a block of tofu (at least overnight, but it can last in the freezer pretty much forever). Then, the morning you are going to make the chili, set the tofu on the counter to thaw. When it is thawed take it out of the package and squeeze the tofu over the sink. Tons of water should come out, like squeezing out a sponge. Then cut it into cubes and it is ready for chili. 2. Add the rest of the ingredients except cilantro and bring to a simmer. Simmer uncovered for about 40 minutes, stirring occasionally. If chili becomes to think or dry, add more veggie broth or water. 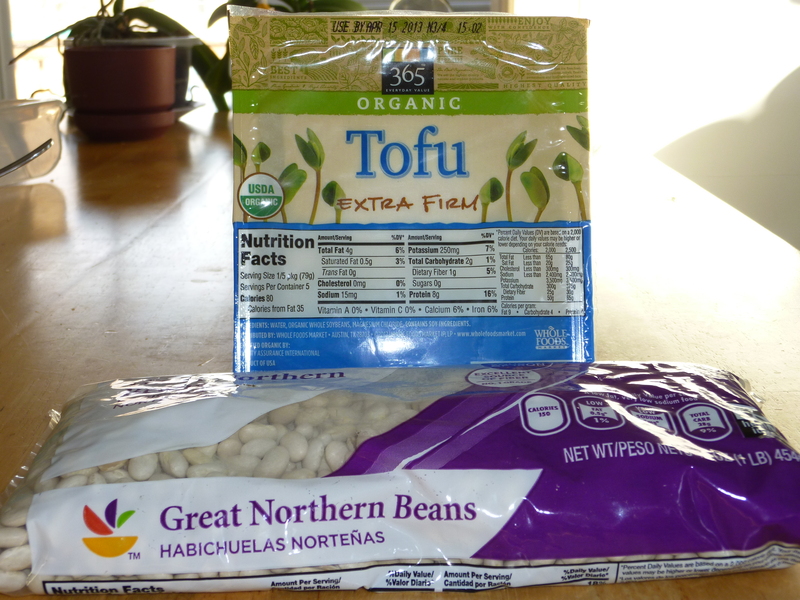 Tofu and white beans make a great snowy chili!